Demonstrates authenticating with OAuth to access a Twitter timeline. 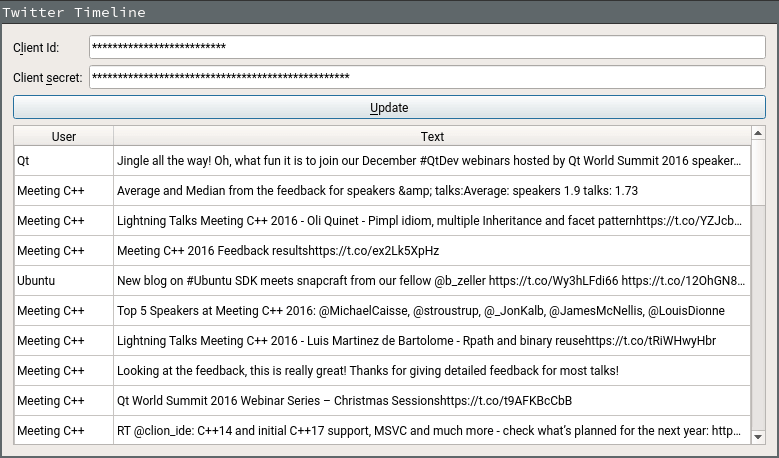 The Twitter Timeline example uses OAuth, as supported by Qt Network Authorization, to sign in to Twitter and display a timeline of tweets (in text format) associated with the authenticated user. To use this example, a consumer key and secret from Twitter are needed. To register the application visit https://apps.twitter.com. You’ll need to add http://127.0.0.1:1337/callback as a callback URL in your Twitter app settings.